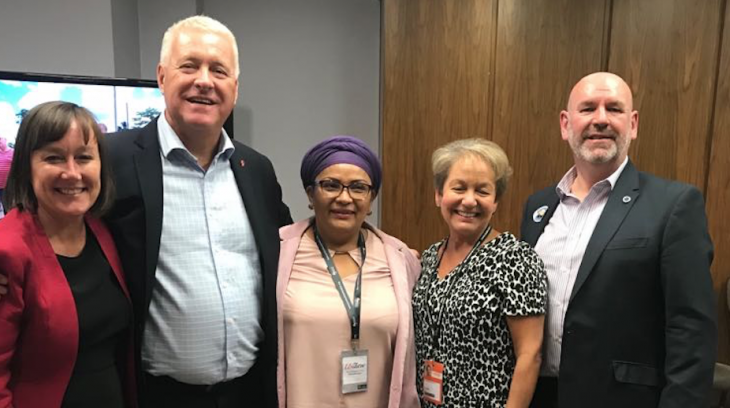 In the first ever visit by the FARC political party to the UK, Colombian senator Victoria Sandino attended the annual Labour Party conference in Liverpool between 23 and 26 September 2018. During the conference, Victoria met with several MPs, journalists, party members and activists. She also spoke at different fringe events, including events organised by JFC and Amnesty International, about the many challenges currently facing Colombia’s peace process, including the shocking levels of violence against social activists and the recent election of the new government of Iván Duque which opposes the 2016 agreement to end over half a century of armed conflict. Victoria Sandino entered the Colombian congress as a senator earlier this year after the FARC were granted a number of seats under the terms of the peace agreement. She was a lead peace negotiator during the 2012-2016 negotiations with the Juan Manuel Santos government in Havana, Cuba, and headed the Gender Subcommission, the first time that a peace process anywhere in the world has had a specific gender focus. Victoria’s visit was organised by Justice for Colombia after she was invited by the Parliamentary Friends of Colombia, a cross party group of more than 60 MPs in the British parliament. To see a Facebook photo gallery of Victoria’s visit, click here.